Weather Forecast - the accurate weather forecast: real-time live weather report, weather online, minute-by-minute weather forecast, hourly weather forecast, 9 day’s weather forecast and weather details from the national weather service(noaa). Are you hunting apps to see what the forecast? Weather Forecast is a reliable weather live and wide weather network forecast, your best choice to get comprehensive weather information, best free weather app(weather pro) let you know today weather, tomorrow weather and future weather info. 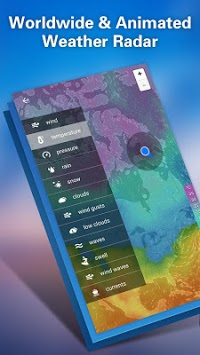 Weather Forecast - accurate weather forecast is a local weather app, and also you can know weather of many places on the world, this means that you can see: US Weather, India Weather, New York Weather, London Weather, Paris Weather...It is really helpful when you is a tourist(aviation weather). Weather Radar & Forecast - weather forecast is a fast, easy-to-use weather radar app that displays animated weather radar around your current location, from the doppler radar, you can see the storm radar and what the forecast is coming your way, so you can tell if storm is headed toward or away from you, and how fast. Weather Forecast is one of the best radar weather apps with the standard pinch/zoom capability which allows you to smoothly zoom and pan around the weather underground and see what the forecast is like anywhere. Weather Forecast - accurate weather forecast also has the real-time hurricane tracking from the national hurricane center(noaa), it's great for the start of hurricane season or windy season. Weather Forecast has the weather widgets can display the current temperature, time and date of current location, simple weather information, daily and hourly forecast. ☀The Real-Time Current Weather: Weather condition now. Temperature in status bar. ☀Hourly/Daily/Weekly Weather Forecast: Minute-by-minute & hourly & 9 day’s weather forecasts. ☀Local Weather Details: temperature and "feels like" temperature, humidity readings, pressure, barometric pressure charts, dew point readings, UV index readings, air quality, wind forecasts and more. 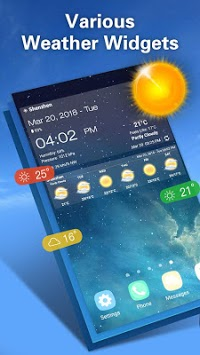 ☀Weather Clock Widget: Various weather clock widget with real-time weather, weather forecast, city, clock & calendar. ☀Notifications View: See current weather conditions & receive weather alerts in your notifications area. ⚡Weather Alerts: Inform you the real-time weather alerts and warnings. ☔Precipitation Forecast(Rainy Weather Forecast): Tell you to bring an umbrella with you before it rains. Weather Forecast is very easy to use. Please open app, enable location then you can receive the weather forecast and weather radar and tell you what the forecast. What the forecast? 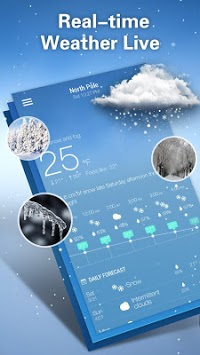 The accurate weather forecast, live weather report, weather radar app will tell you!